I yearn for those rigid flails and tightly clenched tiny baby fists. How can this be? My greatest job in life right now is to help this little soul grow. So why does my heart yearn to turn back time? I’m often caught off guard in these moments. I remind myself what everyone says—things like “it gets better” and “it gets easier.” Why should I feel sad when I have so very much to look forward to?! For us, it’s all been good. I’ve loved every single stage. Even in his neediest, fussiest and my most sleepless moments, I loved it then and I love it now. I know that in a matter of weeks I’ll look back and miss the little baby Miles who’s in front of me today. Even when it’s hard and he’s crying, even when I haven’t exercised in weeks and can hardly remember whether I’ve eaten a vegetable today…even then I’ve loved it all. This has been a big month of ups and downs for us. Miles is doing great. He’s the sweetest, happiest little being I’ve ever known. My favorite thing in the whole wide world right now is when Robert picks him up out of his crib around 6 a.m. when he starts to cry. Robert walks back into our room with Miles glued to his chest like a little sleepy tree frog and gently lies him down between us. Sometimes he’ll nod off for a little while longer. But then he begins to wake up. He stretches his arms and legs, which won’t stop moving for at least the next 20 minutes, and smiles up at us with the greatest gummy grin. He then whips his head from side to side as if trying to get mom and dad to fit with a single glance. What a way to start the day. This is also the month that I returned to work. Working again has been great, actually. I’m so happy editors didn’t forget about me and I feel so lucky that I get to do this job. I enjoy my work and I enjoy earning an income. 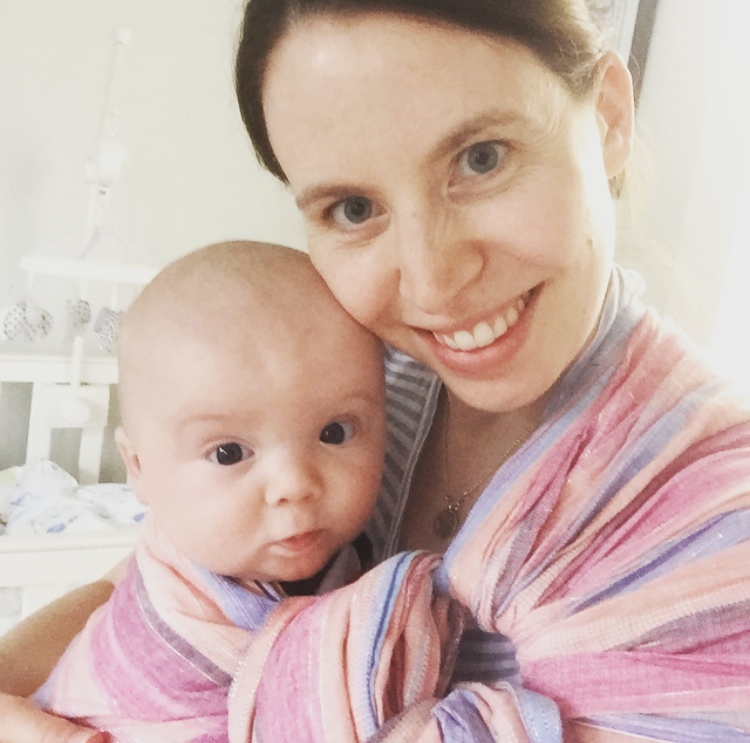 The 14 weeks that I was able to step away from my computer during maternity leave were so very needed. Maternity leave wasn’t exactly what I’d call a restful break (ha! ), but after doing the same job for nearly nine years it was so nice to hop off of the treadmill for a little while. Now that I’m back to work, I’ve never been more focused, organized, or productive in my life. I know that as soon as I finish everything on my To Do list I get to spend time with our sweet baby. On the other hand, figuring out our childcare situation has been a struggle. Before Miles was born, we had a nanny share lined up where I’d take him to the other family’s house three days per week. The nanny had tremendous experience and heaps of glowing references. Everything seemed great. And, to my surprise, I did fine on that first day. I think that I was so focused on getting him there, remembering to bring everything, and getting my work done so I could pick him up that I didn’t let myself feel very much. But day after day, it became more difficult to bring him back. I dreaded it. The nanny did things so differently than we did. When I picked Miles up he was always so tired (from crying? From not napping?) Those few precious hours that I got to spend with him in the late afternoon weren’t with the smiley boy I know him to be. Pretty soon I started finding countless things that felt so very wrong. And so, we decided to end it. I dreaded telling the nanny. I agonized over it and cried more than a few tears. Finally, I made the call. And you know what? She already knew what I was going to say. It didn’t matter what reasons I dug up to explain to her why it wasn’t working. She’d worked with enough parents before and was experienced enough to know why it wasn’t working. I wasn’t ready. The moment she said that I felt a weight I’d been carrying for weeks—long before we started bringing Miles there—melt away. She said exactly what I was unable to recognize in myself. She. Was. Right. I wasn’t ready. Still, I felt silly. Countless new moms return to work even before I did and somehow make it work. It doesn’t mean that it’s easy and it doesn’t mean that they want to, but they do it. Why couldn’t I? I guess the fact that I don’t have the expectation of showing up in an office every day has something to do with it. I didn’t have to power through these feelings and so I couldn’t. What’s more, if I lived in just about any other part of the developed world I wouldn’t be expected to be separated from my baby so soon. There’s good reason for that. Understanding this has helped me put a little less pressure on myself over the fact that I don’t want to leave my baby for eight hours a day. After speaking to the nanny, I called Robert at work and apologized. I don’t want to stifle our son. I want him to be social and adventurous and independent. Being the most understanding human being on the face of the planet (seriously people, I married a saint), Robert reminded me that Miles can’t even sit up on his own yet. It’s okay to want to be there for him, to have him nearby. It makes sense. So what am I doing? I’m still working full-time. But for now we have a babysitter coming to our house during the workday and it already feels like a better fit for us. I’m able to work upstairs while she takes care of him downstairs, but I can pop in for baby smiles, giggles, and kisses any time I like. I should’ve known this was the right path for us from the very beginning, but I also realize that it was impossible to anticipate how I was going to feel. This entry was posted in Miles Atlas, Pregnancy & Baby on June 29, 2015 by Paige Greenfield. WOW !!! he is adorable. I love the pictures. Miles is looks so much like his Dad. However he does have your your beautiful eyes. It is a fun time when they start to roll over, make cute little noises, etc. You made a very good decision and you will all be relaxed and happier for it. Enjoy your summer.